The Great Patriotic War became for the Soviet poster art the real catalyst for the most active development. A common leitmotif of posters of that time was a clear expression of the idea being conveyed, powerful persuasiveness of images and the highest level of patriotic pathos. Even after more than half a century, the works of that period are striking in their strength, confidence, sharpness and unfading freshness. The share of Soviet soldiers at the beginning of the Great Patriotic War fell a lot of tests. Every day for them was a real fight to die in the fight against the dangerous, cunning, superior in number and strength of the enemy. The troops of the Third Reich attacked and attacked, seized the city behind the city, the village behind the village, the village behind the village. By the end of the autumn of 1941, the position of the Soviet Union was unenviable: Kiev, Minsk, Odessa and Kharkov fell, Leningrad was surrounded by Hitler’s troops and concluded in a powerful blockade ring. By November 1941, the enemy approached the main city of the state – its capital, Moscow. At this point, the Soviet party leadership was given the most important and serious task – to throw all the necessary forces to protect the city and in every way to increase the morale and fighting spirit of the citizens. To this end, a powerful agitation was launched, bearing in itself one main idea – to keep Moscow at all costs, never to hand it over to Hitler and his minions. The campaign was conducted on all information fronts: on the radio, in newspapers, through leaflets. 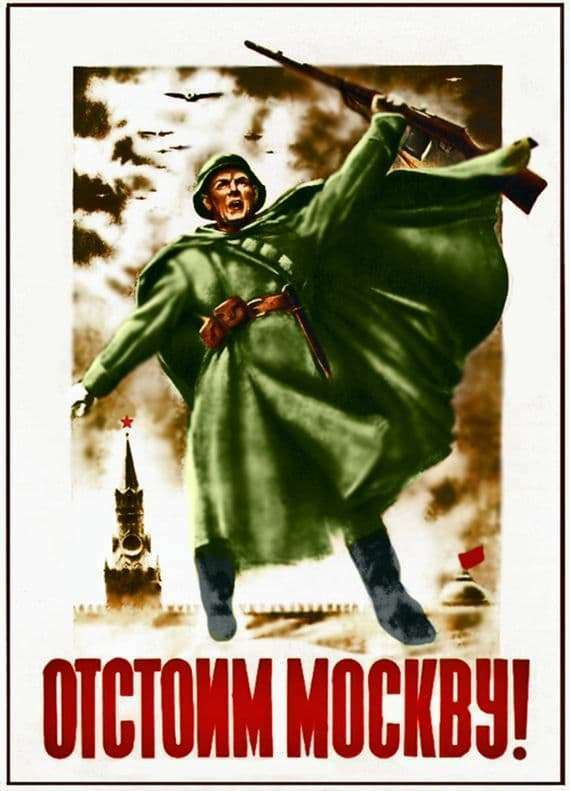 One of the means of agitation was the poster “Defend Moscow!” Drawn by the authors N. Zhukov and V. Klimashin. Together, these two artists managed to create a bright and capacious image of a soldier who protects the capital of his state. In his eyes – determination, in his posture – confidence, in the expression of his face – righteous anger. This soldier is the embodiment of all Muscovites who never surrender their city.